The drone is a marvel of modern engineering as it houses an 8MP camera that records at 1080p from the air. Gone are the days of the selfie sticks, and here’s what replaced it. A high-flying photo-taking drone that is literally a smattering of the size of selfie sticks and more importantly, it fits right in your pockets. Selfly, a smart autonomous flying phone-case has taken the tech world by storm, as it is the first camera to seamlessly attach to smartphones and fly by itself. With a size of just 9 mm thick and weighing less than 70 gms, the rotors of the drone that fold inwards make it possible to pop the drone off the smartphone and launch it from the palm of your hand. The Selfly can then be controlled by a smartphone app. The drone is a marvel of exceptional engineering as it can capture 8MP photos and can record videos of 1080/30p from the air. Moreover, the drone that houses an 8MP camera can swivel 30 degrees and is capable of face recognition too. 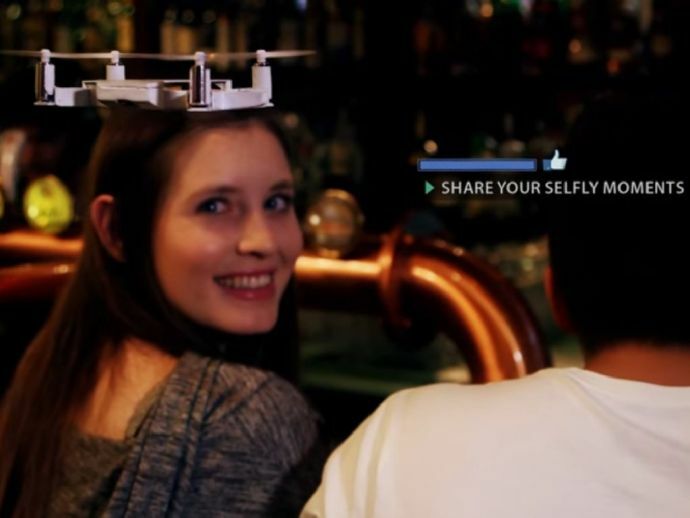 Hagay Klein, the founder and CEO and his team have launched a campaign to get Selfly off the ground and they’re looking to raise $12500. Selfly designs particular cases for most mobile phones, but it also comes with a universal flip cover that will fit any 4 to 6 inch smartphone. Also, the camera drone integrates with any and every of Selfly’s cases. Even on the software front, Selfly works perfectly well with iOS as well as Android devices, effectively covering more than 98% of the smartphone market. Needless to say, this is nothing short of groundbreaking.